You certainly wouldn’t be out of line if you suggested that Daniel Negreanu is the world’s best poker player. Over a career that has been running for more than 20 years, he’s managed to win over $21 million and accumulate 6 WSOP Bracelets. But it hasn’t always been an easy ride for the kid from Canada. Negreanu was born in Canada in 1974 to parents of Romanian descent. His family moved to Canada to give Daniel every chance of success in life. From a very early age, he was a hustler. By the time he was 16, he was hanging out at local pool halls and playing different cards games, learning the basics of poker along the way. Ironically, Negreanu was a strong student who excelled at maths and statistics. However, his love of poker ultimately won the battle for his attention, so he dropped out of school to start life as a professional poker player. The early days for Negreanu were a struggle. He started playing well before the online poker boom. As a result, he was forced to play live at charity casinos and gambling halls in his local area. At the time he was still a teenager and was playing against people twice his age. Despite this, he worked hard and over time found some consistency. By the time he was 21, he was ready for the big time. Negreanu had some success against the locals in Canada, hustling his way to a decent bankroll. However, Vegas was a different story. Finding an edge in the bright lights of Vegas, and with a lot more competition, proved tough. In fact, it wasn’t long before Negreanu blew up his entire bankroll and had nothing left. With his tail between his legs, he made the decision to pack up and move back to Canada to rebuild his bankroll. He effectively started his career from scratch. This time he knew that he had to improve and take his game to the next level. He might have only been a kid, but he knew that his game had leaks. Instead of devoting all his time to playing he started putting in hundreds of hours away from the table, studying and reading poker books. He would analyse the hands that he’d played after each session, examining the different probabilities. He knew what level he needed to get to before he would be able to mix it with the big boys in Vegas. After rebuilding his bank and after putting in hundreds of hours to improve his game, he was ready to have a second crack at Vegas. 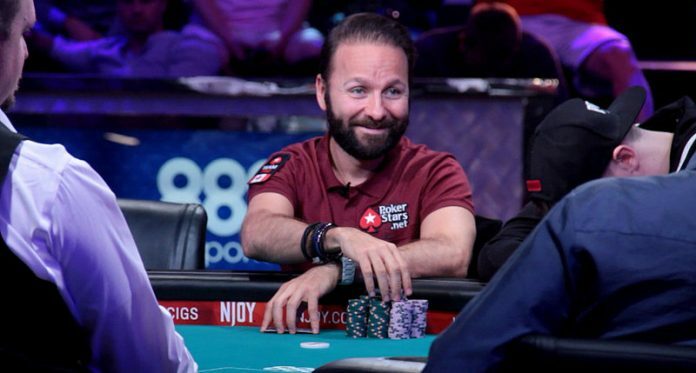 Negreanu managed to establish himself as a regular at the games around Vegas and by 1997 was named all round best player at Foxwoods’ World Poker Final. In 1998, Negreanu entered his first WSOP event. At the time he was only 23, but he already had more than five years of experience under his belt. The event was the $2,000 Pot Limit Hold ‘Em and not only did he play well, but he ultimately took it out. At the time he was the youngest ever winner of a WSOP event. The win earned him the nickname ‘Kid Poker’, and was really the launching pad that got his career moving. From that point forward, Negreanu’s career took off like a rocket. By 2003, he had already established himself as one of the world’s top players. It was around that time that the internet poker boom started taking off and poker players were becoming household names. That year he won his second bracelet, winning a S.H.O.E event that comprised of multiple styles of poker. In 2004, Negreanu had arguably his best ever year. He won his third bracelet and made 11 WPT final tables. Over the course of the year, he won nearly $5 million and was named poker player of the year. For the next decade, his career continued to thrive. He is now the face of ‘Pokerstars’, the largest poker site on the planet. He’s accumulated 6 WSOP bracelets and has won a staggering $20 million from the poker tables alone. It’s been an incredible career for a kid that started out as a hustler in pool halls and lost everything on his first trip to Vegas.